This workshop will provide an in-depth look at the powerful effects of resiliency and strategies for fostering resiliency with Indigenous children. The 4 Blankets of Resiliency: Strong sense of self; family; community; culture, language and connection to the land will be used as a framework throughout the workshop. Participants will gain a unique understanding of how history continues to impact Indigenous children, youth, families and communities. The effect of stress and trauma and why this may cause addictions, various behavioural disruptions and challenges in attachment will be discussed. Monique will examine the impact of these variables on student wellness and the connection to learning. Monique will explain unique techniques to weave the 4 Blankets of Resiliency into all aspects of programming to ensure these factors are part of every students learning experience. The ability to nurture and foster resiliency is one of the most profound ways to make a positive difference in student wellness and learning. Develop a greater understanding of Aboriginal historical perspective and how our history continues to impact children, and families. Greater understanding of fostering resiliency in a cultural context. Exploring strategies for weaving culture into all elements of your programming or practice. 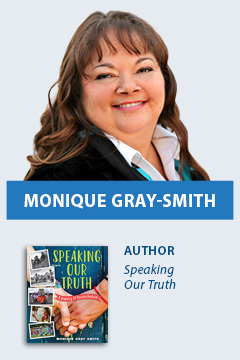 Monique Gray Smith is a mixed heritage woman of Cree, Lakota, and Scottish descent and is the proud Mom of twins. She is an award-winning author, speaker and sought-after consultant. Monique has been running her business, Little Drum Consulting since 1996. Her career has focused on fostering paradigm shifts that emphasize the strength and resiliency of the First Peoples in Canada. Monique’s first published novel, Tilly: A Story of Hope and Resilience won the 2014 Burt Award for First Nation, Métis and Inuit Literature and her first children’s book, My Heart Fills with Happiness recently won the 2017 Christie Harris BC Book Award for Children’s Literature. Her latest release, Speaking our Truth: A Journey of Reconciliation is currently being used across the country as a tool to educate the hearts and minds of both young and not so young readers. Monique has been sober and involved in her healing journey for over 26 years and is well known for her storytelling, spirit of generosity and focus on resilience.